Jamal Eddin Shamil is only eight years old when he is stolen from his native Caucasus Mountains and whisked away by Russian soldiers to the glittering court at St. Petersburg. There Czar Nicholas takes a special interest in his exotic Muslim hostage, the eldest son of Chechen warrior chief Imam Shamil. In St. Petersburg, Jamal Eddin is immersed in imperial life, educated alongside the czar’s own sons and gradually maturing into the consummate courtier. Through it all, he remains true to the Muslim faith of his father—until he falls in love with a beautiful Russian aristocrat. To marry her he must convert to Christianity, a sacrifice Jamal Eddin is prepared to make for the woman he loves. But he doesn’t realize that there are greater forces at work, forces that have lain in wait for Jamal Eddin to come of age and serve the purpose for which he was groomed. And when he is called to return to his native land and take his rightful place as leader of the Muslims, Jamal Eddin must choose: reject his people to follow his heart or abandon his bride to fulfill his duty. 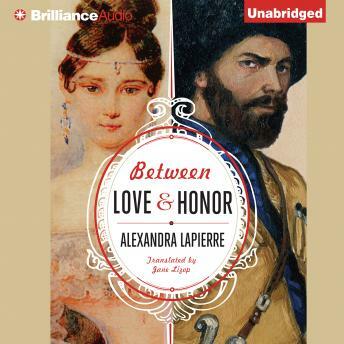 Based on an astonishing true story, Between Love and Honor is a sweeping historical novel in the grand style of Alexandre Dumas and a breathtaking love story of sacrifice and devotion. It was awarded with two prestigious literary prizes upon its publication in France in 2009: the Prix des Romancières award presented by a jury of female novelists, and the Prix Vivre Plus award granted by the monthly magazine of the same name.